Stop for a second and think about this. It’s 2014 and we’re listening to a new Godflesh album, something unimaginable just a few short years ago. Even after their initial reunion for a run of live shows, the prospect of a new album wasn’t much of a reality for a few years. Of course, when you stop to think about it, A World Lit Only By Fire fits into the pattern that’s been developing for a while now – the Earache reunion pattern. You’ve got Carcass and At The Gates with new records. Did you ever think that would happen? So at this stage should we be surprised that Justin Broadrick would follow suit? Perhaps not. Whatever the case may be, here we are listening to A World Lit Only By Fire, the first Godflesh full-length since Hymns in 2001 but not the first sliver of new music from Godflesh in that time. Strangely the band decided to release the Decline & Fall EP earlier in the summer. Maybe it was intended as a salvo or tease, something to sate our appetite and while the crushing industrial metal that we expected was all over this EP and reasonably solid, it felt like it served little purpose in the grand scheme of things. Just give us the album already and here it is. A World Lit Only By Fire straddles a line between the earth shuddering machinations of the band’s Streetcleaner style and the melody and gleam of their latter work, a sensible approach to take if any. Recreating the tone and vibe of Streetcleaner would be a futile endeavour quite frankly and simply picking up where they left off in 2001 would feel forced; that’s more or less what Jesu did anyway. Make no mistake, this album is still crushingly heavy though, dialling up the bass in the mix to uncomfortable levels while Broadrick’s guitars churn away on motorised riffs and barking vocals emerge through the hazy noise as you would expect. Is it all a little predictable? Yes, but at the very least Godflesh sound like they really care about making a return album that’s worth your time. Riff wise, Broadrick is focused heavily on groove here. A track like ‘Deadend’ just easily ambles on but is still utterly crushing. This recipe is repeated throughout the album but never becomes tiresome in the slightest, complemented perfectly by that unrelenting juddering heft in the guitar and bass tone. This is all tastefully offset with well-placed hooks; like ‘Carrion’s riffs that, while rather simplistic, are shamelessly memorable all the while sitting next to some of Broadrick’s harshest vocals on the record. Vocally, JKB sticks with his coarse bark throughout the record, unlike Jesu, the project that has taken up most of his time since Godflesh folded. Occasionally we’ll hear his ghostly clean croon like the haunting and mesmerising ‘Towers of Emptiness’ but the focus on harsh vocals serves the record best, constantly reminding us what a pulverising force Godflesh were (and are) meanwhile ‘Forgive Our Fathers’, perhaps fittingly as the closer, is the most melodic effort (relatively speaking) on the record as Broadrick finds his verve in spectral Jesu-like vocals over the robotic mechanical riffs. A World Lit Only By Fire shows that Godflesh haven’t missed a step but where exactly does it nestle in the band’s broad catalogue? It’s something that’s more likely to appeal to the Streetcleaner and Slavestate aficionado or even those wishing to purge the memory of the late ‘90s and early ‘00s. It’s certainly not on par with their finest work but from this early vantage point, time may very well be kind to A World Lit Only By Fire. 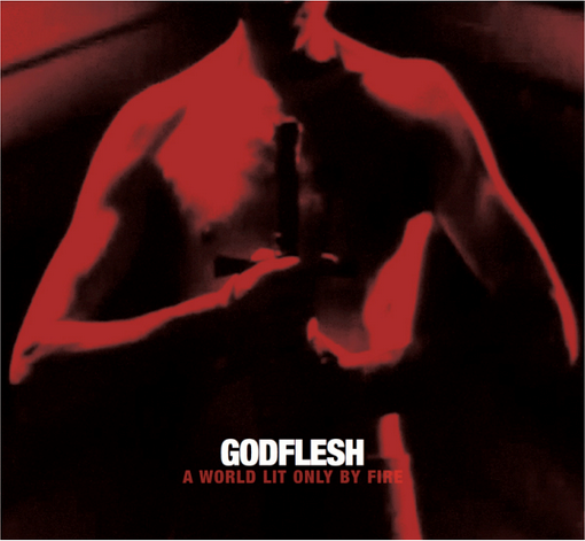 Tags: A World Lit Only By Fire, Godflesh. Bookmark the permalink.